In a major setback for Delta Tunnels proponents, the California Department of Water Resources (DWR) Friday sent a letter to Randy Fiorini, chair of the Delta Stewardship Council, announcing the withdrawal of the Department’s “certification of consistency” for the California WaterFix. The “certification of consistency” with the Delta Plan is required under the Delta Reform Act of 2009. In their controversial document, DWR claimed that the Delta Tunnels would be “consistent” with the Delta Plan’s “co-equal goals” of providing a more reliable water supply for California and protecting, restoring, and enhancing the Delta ecosystem, but nine appellant groups challenged this contention. Following the action by DWR, the Council’s Executive Officer Jessica Pearson dismissed the appeals as “no longer raising issues before the Council,” thereby lifting the ex parte restrictions that had prohibited its members and staff from working with the parties outside of the Council’s appeals process. This is a big victory for opponents of Governor Jerry Brown's Delta Tunnels project - and indicates that the future of the tunnels project will depend largely on what Governor-Elect Gavin Newson intends to do once he takes over from Brown in January. Delta advocates celebrated DWR’s withdrawal of the certification, but said the Delta is still imperiled by the deal between Governor Jerry Brown, President Donald Trump, Senator Dianne Feinstein and House Speaker Kevin McCarthy to increase water deliveries to corporate agribusiness at the expense of West Coast fisheries, the San Francisco Bay Delta ecosystem and the public trust. “Otherwise she would not be working with lame duck leadership, and instead would be getting ready to create a sustainable water plan for California with new her Democratic colleagues in the House of Representatives in January. Today is a good day for the San Francisco Bay-Delta and California. But it's not over yet,” Barrigan-Parrilla concluded. The release of the staff report was then followed by a Council workshop in Sacramento on November 15 during which Council Chair Randy Fiorini and Council Member Frank Damrell suggested that DWR withdraw their controversial document. 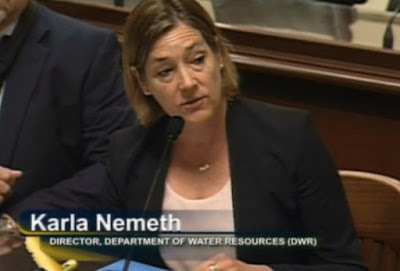 “Fundamentally, my takeaways so far after reviewing the record, listening to the testimony at the October hearings, and after today, I think the Department has filed its certification of consistency before it was ready to demonstrate consistency with the Delta Plan….. I would strongly encourage the Department to consider withdrawing the certification of consistency,” said Randy Fiorini, DSC Board Chair, at the end of the meeting. Caleen Sisk, Chief and spiritual leader of the Winnemem Wintu Tribe, pointed out the connections between the Delta Tunnels, Sites Reservoir and the Shasta Dam raise that the WIIN Act facilitates. “The Twin Tunnels, Sites Reservoir, and the Shasta Dam raise ‘are all 1 Brown WaterFix project’ to get the Water Mongers more water to sell back to the communities, towns and cities,” she stated. If constructed, the tunnels project would destroy West Coast fisheries and hasten the extinction of Sacramento River spring and winter chinook salmon, Central Valley steelhead, Delta and longfin smelt and green sturgeon. The two massive tunnels would also imperil the salmon and steelhead populations on the Trinity and Klamath Rivers.